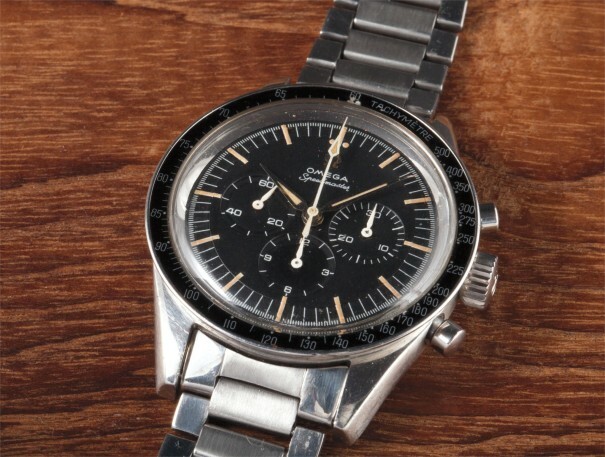 The celebrated Omega Speedmaster was launched in 1957 and aimed at an “active clientele”. The tachometer scale on the bezel should help scientists and sportsmen with the calculation of speed. The original Speedmaster reference 2915 was in production for only two years until it was replaced in 1959 by the present model, reference 2998. The example offered here dates from 1960, featuring the legendary calibre 321 and has the correct black tachometer bezel graduated to 500 units. The original chronograph hands as well as all the luminous on the dial are amazingly well preserved. Lastly, the watch is completed by the correct Omega steel bracelet reference 7912. Model: Pre-Vendome, Mare Nostrum "SLYTECH"
Model: Explorer II, "Cream Dial"
Model: Oyster Cosmograph "Paul Newman "Panda"
Model: Oyster Perpetual "Bubble Back"
Model: Oyster Perpetual, "Bubble Back"
Model: Oyster Perpetual. "Bubble Back"